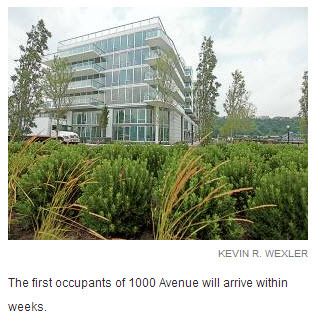 In another sign of the housing market’s recovery, homebuilder Lennar Corp.opened a seven-story, 74-unit luxury condo building in Weehawken Tuesday, and it has already started construction on another next door. The two are the first of five condo buildings Lennar plans on the Hudson River waterfront, part of the redevelopment of Port Imperial, a 200-acre, $2-billion master-planned community that stretches two miles along the river, replacing derelict industrial space from the last century. After slowing down during the recession and housing bust, construction along the river has boomed. At an official opening ceremony Tuesday, Weehawken Mayor Richard Turner said there are a total of seven buildings under construction in town. “When the market is ready, the market is ready,” Turner said. The Lennar project, called the Avenue Collection, reflects the statewide increase in multi-family construction, which has accounted for about 58 percent of homebuilding activity this year in New Jersey. But the project also represents one significant departure from the statewide trend, because the units are for sale, while most of the new multifamily construction in the state is for rent. Demand for rentals has been high, as households found it difficult to qualify for mortgages, or chose not to buy because they wanted more flexibility in a time of uncertain job and housing markets. 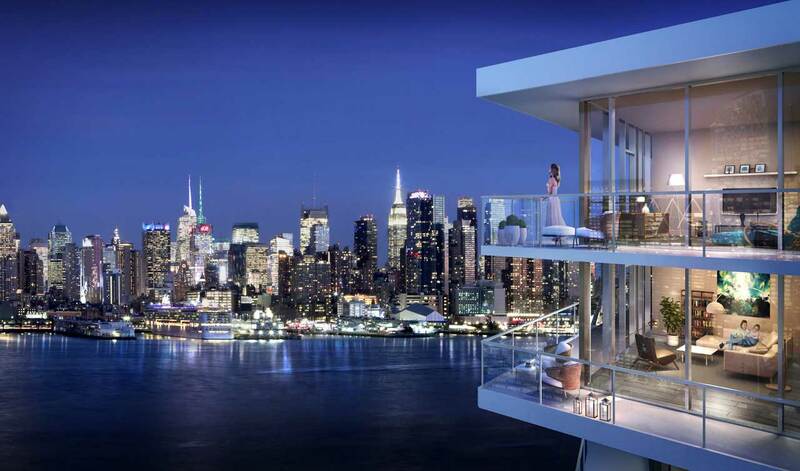 But Lennar, which is based in Miami, has found there’s also demand for condos, at least on the Hudson waterfront. The building that opened Tuesday, at 1000 Avenue at Port Imperial, is 60 percent sold, with prices that started at $805,000 and went up to almost $4 million. Units still available range from $1.1 million to $2 million. The first homebuyers are expected to move in within several weeks. The units have floor-to-ceiling glass windows, framing views of the Manhattan skyline, the George Washington Bridge and the ferries plying the river from the nearby NY Waterway terminal. Craig Klingensmith, division president for Lennar Northeast, said that sales at the first building were strong enough that the company decided to move forward with the second, a 103-condo building next door. That is expected to be completed by the end of 2015. The company expects to start a third building in 2015, for completion in 2017. Ultimately, the Avenue complex will consist of 669 condos in five buildings. Roseland Property of Short Hills, a subsidiary of Mack-Cali Realty Corp. of Edison, is the lead developer of Port Imperial, which in addition to Lennar includes buildings constructed by Hovnanian Enterprises Inc. of Red Bank. 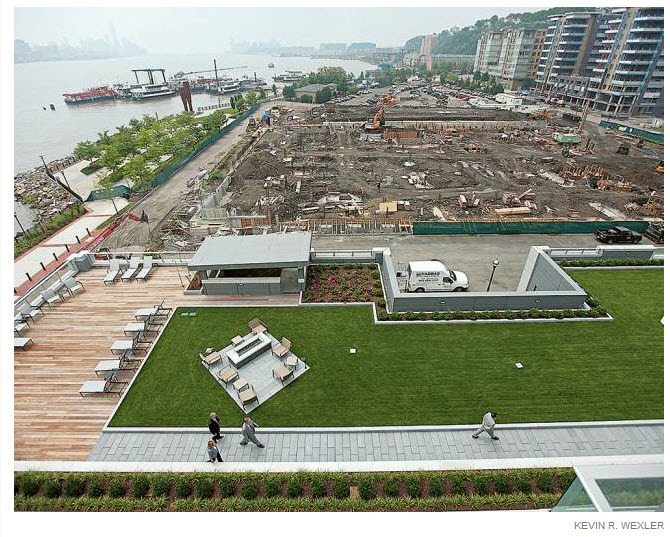 Port Imperial is just across the river from midtown Manhattan in Weehawken and West New York. The first proposals to redevelop the old industrial land were made about 30 years ago, and construction began in the late 1990s. When it is done, Port Imperial is expected to include about 6,000 housing units in two dozen buildings, along with office, hotel and retail space. During the housing bust, home construction in New Jersey plummeted to an annual average of 13,000 units from 2009 to 2011 – the deepest slump since World War II. Now, the sector is on track to have its strongest year since the recession. Through May of this year, almost 11,000 housing units have been approved in the state, up about 20 percent from the same period in 2013. Even with the improvement, the pace of homebuilding remains below New Jersey’s long-term averages, above 30,000 units a year.